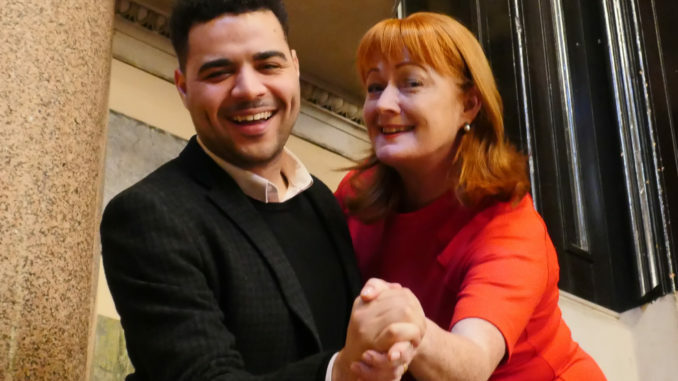 Liverpool based Charity Nugent, launches its third annual dance competition and gala fundraiser, Strictly Nugent 2018, which this year takes place in St George’s Hall on October 27th. The hosts for this year’s glamorous ballroom competition are Ben Osu and Helen Jones. Helen is BBC Radio Merseyside’s Sunday morning presenter and producer and Ben is a local presenter and compere, and has hosted some of the city’s major events including LIMF, the River Festival, Brazilica and more. Helen and Ben will be introducing the show which gives 12 people the chance to dance live in St George’s Hall with their professional dance partner to win the coveted Judges Award! All our dancers are busy training with their professional partners on their routines and will be competing together on the night in front of our audience and our panel of Judges, for the coveted Judges and Audience Winner’s Trophies. Strictly Nugent 2017 threw up a big surprise, with one couple winning both the Judges’ trophy and The Audience’s trophy! Now in its 3rd year, Nugent’s signature fundraising event has raised over £90,000 in the last 2 years to help vulnerable children and families living with poverty, this year aims higher than ever to raise vital funds to support Nugent’s work. Tickets are on sale now at Eventbrite. For just £75 you’ll enjoy a formal dinner followed by 2 hours of beautiful dancing from our competitors and their professional partners, and an after show disco in the awe-inspiring Great Hall at St George’s Hall, Liverpool! You can also buy a show only ticket for just £25, which includes the full show and the after show disco. A fabulous opportunity to support Nugent’s vital work in our community. Vicky Jaycock, Hospitality Sales Manager at Liverpool Football Club. Sarah Johnson, a Public Sector Director and Governing Body member for Nugent. Richard Smith, Business Engagement Manager for Liverpool & Sefton Chamber of Commerce. Beth Pinches, Activities Co-ordinator at Nugent’s Margaret Roper House in Birkdale. Paul Evans, Owner of Evans MOT Centre in Huyton. Ashleigh Evans, Currently training to be a teacher and starting her own business.